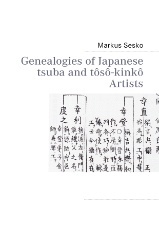 The aim of this publication is to make the genealogies of the Japanese tsuba and tôsô-kinkô schools easily accessible to the reader, namely in that they are complete and have been revised for the first time, in a single book. The book contains 120 genealogies of all the major schools, divided up into two sections: the tankô who worked in iron, and the tôsô-kinkô who processed soft metal. For a better use of the genealogies, an extensive index is added at the end of the book.